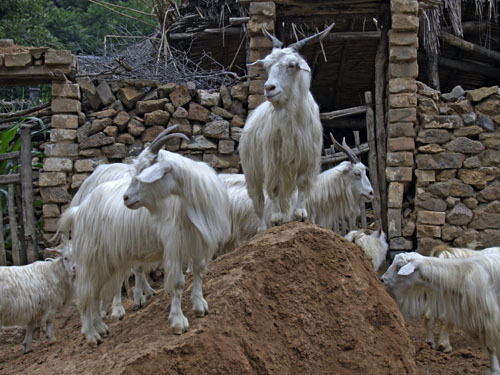 Long-haired goats in the village of Houchuan. Hebei Province, China. IPTC Keywords: China Great Wall Great Wall of China wall World Heritage hike hiking trek trekking walk walking expedition challenge challenging northern China rural China countryside Chinese guided walk guided trek guided hike Ming Dynasty Ming wall Beijing watchtower tower fortification defensive wall turrets battlements crenellations crenellated Hebei Province Houchuan Simatai Si Ma Tai goats.